When Dan Horn began talking to inanimate objects and then making them talk back, he had no way of knowing his childhood hobby would later become a thriving career—one that would (so far) involve him with city and state governments, legendary Arizona television shows, give him the chance to meet wonderful people (like Jimmy Nelson, Paul Winchell and Edgar Bergen), take him all over the world and provide him with innumerable rewarding experiences. In 1979 the City of Phoenix and the State of Arizona contracted Dan to write and perform a program about traffic safety for elementary and middle schools. Within a five year span, Dan (the only taxpayer-supported professional ventriloquist anywhere) appeared live at one hundred-plus Arizona schools many times over. His unique one-man show It Doesn’t Hurt to Be Safe generated a great deal of local and national attention. Dan Horn and his puppet “friends” attended the 1981 annual Congress of the National Safety Council as honored guests and played to great acclaim. Next, an independent production company in New Jersey produced a film version of Dan’s show titled Dan Horn and his Safety Squad. Coupled with an educational package Dan helped develop, it continues educating and entertaining school children nationally. SAMCOR, the parent company of Phoenix Good Samaritan Hospital, utilized Dan's ability to communicate with children in the educational video series Just For Kids. In these eleven health-oriented programs, on various topics ranging from the systems of the body to dealing with death and dying, Dan acted as the on-screen talent (along with his “Cast”), creative advisor and co-writer. The programs have been honored with many awards in the field of education and number seven in the series, Peer Pressure, was nominated for a Rocky Mountain Emmy. In 1980 Dan joined the cast of KPHO Television’s The Wallace & Ladmo Show (which aired in Arizona from 1954 to 1989). For eight years Dan and his puppets were a featured part of this popular and unconventional kids TV show. Altogether, it broadcast each weekday for thirty years making it the longest running TV show with the original cast in history. The secret of the show’s longevity was that it was just as popular with college students and adults as it was with kids. Stephen Speilberg, a former Phoenix resident, mentioned his love for the show in an interview on Entertainment Tonight. Two plays about the show have been successfully produced. Two books have been written on the subject and the Arizona Historical Society museum houses a permanent exhibit preserving sets and many artifacts from the show—including some of the original puppets Dan created and performed with. Dan was able to contribute many aspects of his creativity to the show: comedy writing, performing, puppeteering, puppet design and fabrication, costume and prop construction, drawing, and music composition. 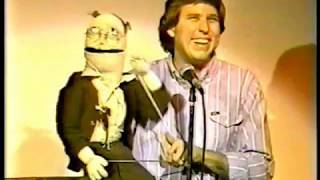 Exposure from this extremely popular show with its irreverent approach to “kids” comedy made Dan Horn and his puppets very well known throughout Arizona and the Southwest. Dan also wrote and appeared in various television and radio commercials for local businesses like 21st Century Sound, Off the Wall Beds and The Ore House restaurant. Dan’s performances at comedy clubs, colleges, casinos, conventions and corporate congregations (that’s a lot of “C” words!) established that he is not just an entertainer for kids. Headlining legendary comedy clubs and major chains as well as feature-act engagements in revues and at corporate functions reveal the versatility of Dan’s abilities and appeal. Among the many notable performers Dan Horn has worked with are: David Spade, Rosie O'Donnell, Dana Carvey, Kip Addotta, Steve Landesberg, Bruce Baum, Rich Jeni, Brad Garrett, Gabe Kaplan, Pat Paulsen, Morey Amsterdam, Howie Mandell, Jackie Vernon, Rita Rudner, Bobcat Goldthwaite and the host of The Tonight Show Jay Leno. Musical acts Dan Horn has opened for include Tower of Power, John Tesh, jazz guitarist Stanley Jordan and contemporary artist Al Stewart. Although Dan Horn spends a great amount of time traveling the road performing, his favorite place to be is home in Chandler, AZ with his biggest fans—his wife, Royce, their daughter, Quinne, and son, Sean.